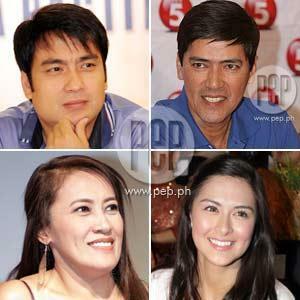 (Top) Sen. Bong Revilla and Vic Sotto will team-up for the first time in Ang Agimat ni Enteng; Ai-Ai delas Alas (bottom, left) reprises her role in Ang Tanging Ina Mo Rin (Last na To!) and Marian Rivera (bottom, right) will star in the remake of Super Inday and the Magic Bibe. The Selection Committee of the Metro Manila Film Festival-Philippines (MMFFP) has announced the eight official entries for this year's annual filmfest. Ang Agimat ni Enteng, comedy, action, fantasy by M-Zet/GMA Films/Octo Arts Films/Imus Productions/APT Productions, starring Vic Sotto and Bong Revilla, Jr.
Ang Tanging Ina Mo Rin (Last na To! ), comedy by ABS-CBN Film Productions/Star Cinema, starring Ai-Ai delas Alas. Dalaw, suspense thriller, Cine Media. Rosario, drama-filmbio by Cinema Buhay, starring Dennis Trillo, Jennylyn Mercado, and Sid Lucero. Father Jejemon, drama comedy by RVQ Productions, starring Dolphy. RPG, an animation film, by ABS-CBN Film Productions/Ambient Media. Shake, Rattle and Roll XII, horror-suspense by Regal Entertainment, all star-cast. Super Inday and the Magic Bibe, comedy-fantasy by Regal Entertainment, starring Marian Rivera. A ninth entry was also named, Ana Salamangka from Reality Entertainment. According to the MMFFP officials, the said film will automatically qualify as the eighth official entry should any of the official entries encounter a problem in meeting the deadline, and other setbacks. The 2010 Metro Manila Film Festival-Philippines will run from December 25, 2010 to January 7, 2011.